The past week was critically important for Sri Lanka since it hosted two foreign dignitaries for the 14th International Vesak Day celebrations held in Colombo and Kandy. The celebrations initially inaugurated by Indian Prime Minister Narendra Modi ended with Nepal President Bidhya Devi Bhandari’s presence at the closing ceremony in Kandy. The regional focus was on Sri Lanka due to the presence of the Indian Prime Minister to inaugurate international Vesak celebrations. Nearly a billion people across the sub-continent would have watched Indian Prime Minister Modi delivering his speech on Lankan soil where he brought out the relevance of the Buddha’s teachings in today’s context. The world owes Sri Lanka for preserving unsoiled Buddhism were his emphatic words. Although State visits by foreign leaders do not usually have political overtones and in this particular case it was for the sole purpose of participating in Vesak celebrations (apart from a public rally in the upcountry), that did not prevent the Joint Opposition from branding it as a working visit where several agreements with Sri Lanka would be signed. They had created an anti-India climate especially in rural areas by highlighting that the Indian Premier would be here for signing the Economic and Technical Cooperation Agreement (ETCA) and the Trincomalee oil farm deal. The Government categorically denied these accusations and as the visit unfolded it became clear that no such agreements were to be signed. Prime Minister Modi made a brilliant speech extolling the virtues of the Buddha Dhamma at the UN Day of Vesak inauguration. The Joint Opposition chose vituperative language to oppose the arrival of Indian Prime Minister Modi. This job was foisted on Wimal Weerawansa and Udaya Gammanpila, who have a penchant to be in the forefront in all political melees. During his May Day speech Weerawansa called upon the masses to hoist black flags as a mark of protest against the arrival of Prime Minister Modi on the Vesak day but none was seen in Colombo or elsewhere. People do enjoy his garrulous political rhetoric but may not consider him a serious politician. On many an occasion he had been virtually reduced to a political clown by his own actions. Starting from the famous fast unto death near the United Nations compound against the Darusman report on Sri Lanka, more recently he added another feat to his records by fasting inside the remand prison against the judicial order that denied him bail. However his leader Mahinda Rajapaksa was quick to disassociate with Weerawansa’s sentiments when he told journalists he had no objection to Modi’s visit to Sri Lanka and qualified his statement saying “as long as no agreements detrimental to the country are signed”. By this time arrangements have been finalised to have a late night tete-a –tete by the two leaders. 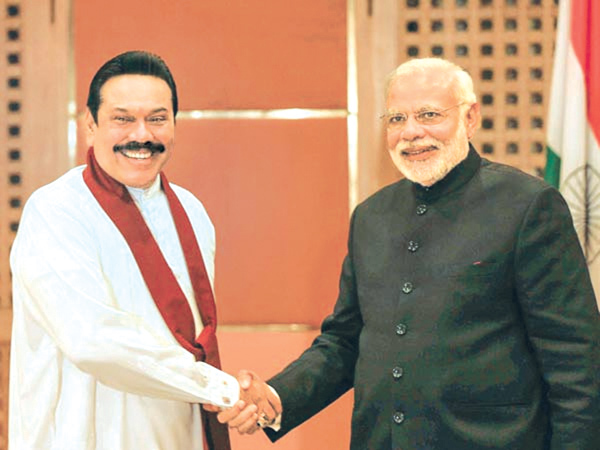 Prime Minister Modi met former President Mahinda Rajapaksa, who was accompanied at the discussions by former Defence Secretary Gotabhaya Rajapaksa and former Foreign Minister G L Peiris. This meeting was not on the original agenda of Prime Minister Modi. Unlike Weerawansa, Rajapaksa has a better grasp of international geopolitics and knows that keeping communication lines open to the corridors of power in New Delhi is essential, regardless of whether one is in power or in the Opposition. Although no formal communiqué was issued by the Indian side, The Hindu reported on the meeting, quoting sources close to the former president, who was perceived by many in the Indian establishment as being very close to China. Indian Prime Minister Narendra Modi meeting former President Mahinda Rajapaksa during his recent visit to Sri Lanka. Professor GL Peiris told journalists that he could not reveal the outcome of the talks between Prime Minister Modi and former President Mahinda Rajapaksa. “That is all confidential,” he said. Media report also said that India had invited Rajapaksa but there lies a disability ahead of Mahinda Rajapaksa which disqualifies him from contesting for the Presidency again in terms of 19th Amendment to the Constitution. Opinions were divided on why Gotabhaya took part in the discussions, but commentators were of the opinion that he is being seen as a future political candidate due to his brother’s inability to contest again and discussions of this nature would raise his profile. Notwithstanding what Prof. Peiris said, Rajapaksa maintains the position that they never discussed politics. GL was thankful that the meeting was granted at short notice but diplomatic sources say that Indian High Commissioner Taranjit Singh met with Mahinda Rajapaksa ahead of Modi’s visit to Sri Lanka. The Sri Lankan President too was in the know of the meeting that took place at the India House. The meeting however did not come as a surprise to many since Modi had developed some sort of acquaintance with Mahinda Rajapaksa over the years. Now it is a totally different political scenario with the Unity Government in power. India’s aim now is to cultivate President Maithripala Sirisena who is at the helm. It is more important to them for reconciliation efforts and to create a more conducive environment for the Tamil people in the North and the East and also for security in the Indian Ocean region where India’s concerns are quite visible. The one major casualty of this meeting was none other than MP Weerawansa who ended up with egg on his face after the Modi-Rajapaksa meeting and Rajapaksa’s participation in the opening ceremony of the UN Day of Vesak. Cartoonists had a field day lampooning Wimal, who was depicted in most cartoons with a black loincloth covering his modesty. Worse, by May 12 several websites had published pictures of his Hokandara residence, which did not have either black flags or Buddhist flags. Several television stations also showed the houses of other prominent JO members, none of which had black flags, though some had Buddhist flags and Vesak decorations. Weerawansa had since kept a low profile probably on the advice of his mentor, Mahinda Rajapaksa MP. Modi received a rousing reception from the estate sector population, most of whom are descendants of labourers brought from India for working in the tea plantations. 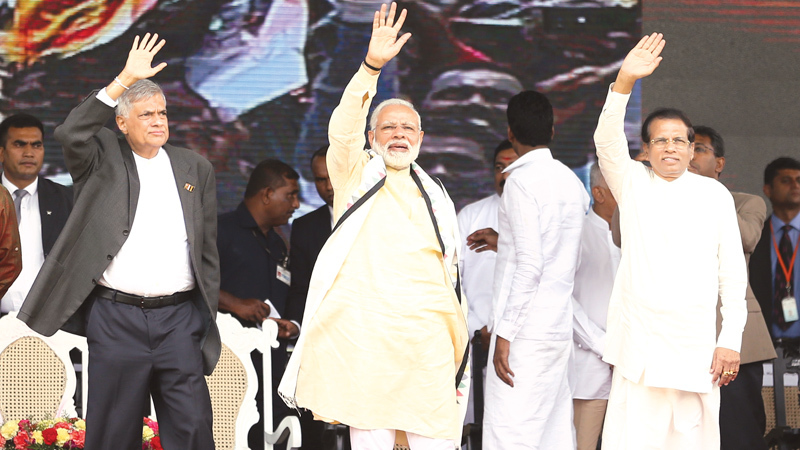 Significantly, both President Maithripala Sirisena and Prime Minister Ranil Wickremesinghe addressed this gathering in Norwood in addition to the Indian Premier. The speeches were well received by the enthusiastic crowd, especially Prime Minister Modi’s reference to the late minister and plantation patriarch Saumyamurthi Thondaman. The Tamil National Alliance (TNA) too secured a last-minute meeting with Prime Minister Modi at the Bandaranaike International Airport prior to his departure to India. All the leading parties of the TNA were represented, though the TNA did not extend an invitation to Northern Province Chief Minister Justice C V Wigneswaran. The TNA later explained that this was not a deliberate omission, but only the TNA party leaders were invited to the meeting with Premier Modi. They had discussed current political developments and urged India to exhort the leadership in Colombo to consider the re-merger of the North and the East and several other demands. The other major development was the re-surfacing of speculation on the much-delayed Cabinet reshuffle. This is now expected to take place once Prime Minister Wickremesinghe returns from China, after participating in the One Belt, One Road (OBOR) Summit. Cabinet meetings have been suspended until a new Cabinet is announced. There is speculation that some portfolios could be swapped and new ministries given to certain key players of the 2015 Rainbow Revolution who had seemingly been not been given major portfolios. Sources in the UNP and the SLFP say differences between the two sides on a Cabinet reshuffle have been ironed out. Incidentally, Minister Sujeewa Senasinhge’s presence at religious ceremonies held in connection with the demise of former President Rajapaksa’s younger sister set off a flurry of talk in political circles as Senasinghe had publicly expressed his dissatisfaction at the status quo of the UNP, saying he had been sidelined. He has also threatened to quit politics, but said he would never leave the UNP. Any talk of a defection is premature as an election is not on the immediate horizon but this should serve as a reminder to the UNP to take care of the younger leaders who had played a major role in the electoral transformation of 2015. With a national election due only in 2020 and no fixed date for the Local Government elections, all parties have turned their attention to political maneuvers in the Provincial Councils, though elections to at least three of these are also due this year. The parties are vying to take over the Councils by certain ‘balance of power’ manipulations, but many Constitutional experts have pointed out that there is no provision in the Constitution or in the Provincial Councils Act for such a transfer of power. The two PCs in question are North Central and Central. The crisis in the North Central Provincial Council (NCPC) was precipitated by 18 United Peoples Freedom Alliance (UPFA) councillors deciding to work independently, with most of them, if not all, actually supportive of the JO. Their reason for the decision was the NCPC Health Minister K H Nandasena’s removal on Wednesday and the resignation of the Trade Minister S M Ranjith. SLFP officials said these members had been promoting ‘another party’, a clear reference to the JO, instead of the Sri Lanka Freedom Party (SLFP) of which they were members. In fact, Nandasena was seen at the JO May Day rally at Galle Face Green. This does not in itself lead to a change of power (in essence, a new chief minister) at the Council, unless they join the main opposition in the Council, the UNP (which has 11 members and the JVP has one) because the United People’s Freedom Alliance (UPFA) has the majority in any case and the newly independent MPs also function within that group. This is similar what happened in Parliament, where the JO was not recognized as another political party or given the Opposition Leader Post by virtue of the fact that they still represent the UPFA. According to the Provincial Council Act, only the General Secretary of the ruling party of a given PC has the authority to change the Chief Minister. The only other way another group could change the administration of a PC is by defeating the budget. In the NCPC’s case, there is no impending budget and its term is expiring in 4 months any way. The NCP Governor has already rejected a petition calling for the ouster of Chief Minister Peshala Jayaratne and replacing him with S M Ranjith. A crisis seems to be brewing at the Central Provincial Council too. 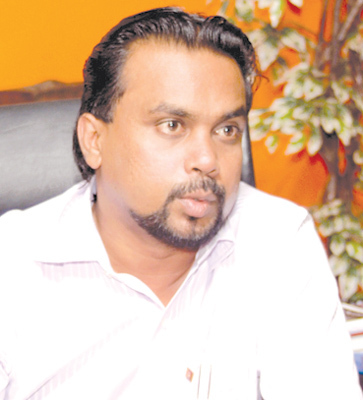 UPFA member Pramitha Bandara Tennakoone, who relinquished his ministerial portfolio recently in protest against the removal of his father from the party organiser’s post, said steps will be taken to change the power equation in the council. Sensing an opportunity, the UNP members of the Council said they are ready to take over power in the CPC, but this has been shot down by CM Sarath Ekanayake who has accused the UNP of “daydreaming”. Meanwhile, former President Mahinda Rajapaksa does not want to destabilize the Provincial Councils (PCs) administered by the United Peoples Freedom Alliance (UPFA), Western Province Chief Minister Isura Devapriya told the media. Both President Sirisena and Prime Minister Wickremesinghe are aware that focusing on their respective parties’ internal problems could take their attention away from the greater governance issues. Thus they have to resolve inner-party problems while smoothing out any ruffled feathers vis-à-vis the other partner in the National Unity Government. MP Geetha Kuamarasinghe has received a stay order from the Supreme Court with regard to the appeal court verdict on the annulment of her Parliamentary Seat. It was quite unusual for the Supreme Court to take up Leave to Appeal matter in such a hurry counsel for the petitioner respondents, J C Weliamuna told a three judge bench of the Supreme Court when it was taken up on Friday. It is usually the Registrar of the Supreme Court who looks into these matters. Under normal circumstances it never happens and for ordinary citizens that privilege is not available, Weliamuna who is billed to take oaths as a President’s Counsel shortly told Court. He requested Court not to make any order since there was no time to study the appeal papers. Deputy Solicitor General Janaka de Siva who appeared before the Court expressed similar sentiments when he said that it should not incline towards making any order since time did not permit him to study the matter and he was informed of Court notice by the Secretary General of Parliament a short while ago. However Respondent Appellant Geetha Kumarasinghe who retained Romesh de Silva PC’s submissions prevailed. The Court issued an interim order stalling the verdict of the Court of Appeal order till last Monday, which unseated Geetha Kumarasinghe by way of a quo warranto. On Monday it came up before a different bench comprising Justices Eva Wanasundera, Gamini Abeyratne and Anil Gunaratne. Once again the Court stalled the operation of the Court of Appeal order this time until the final determination of the matter. It was revealed by the State that that there was evidence to substantiate that Kumarasinghe was a dual citizenship holder. The crux of the argument of Geetha Kumarasinghe was that he Swiss citizenship was not intentional and she received it through her marriage. The Court however decided after a respite by majority decision to stall the operation of the order of the Court of Appeal while Justice Anil Gunaratne declined. The earlier stay order prevented the Chairman of the Election Commission from acting upon the written communication by Secretary General of Parliament. The case also went down to September which will allow Kumarasinghe to sit and vote in Parliament. However many are of the opinion that this important constitutional issue should receive priority attention of the Apex court with a fuller bench since otherwise people will feel that justice delayed and justice is denied. Other MPs having the same issue will be watching the developments in this case with much interest since their seats are also at stake. However, apart from MP Basil Rajapaksa, no other MP has admitted to being a dual citizen and some, like Minister Mahinda Samarasinghe, have rejected allegations on dual citizenship. Some commentators have pointed out that the dual citizenship issue would only affect Parliamentary elections and any dual citizen can still be a candidate in other elections. Concerted efforts are being made to address the SAITM (South Asian Institute for Technology and Medicine) issue which has been severely disruptive. The Government has requested SAITM not to admit any new students until concrete and viable policies on private universities are formulated, while the Neville Fernando Hospital will be taken over by the Government. SAITM is likely to continue as a separate entity, albeit one listed on the Colombo Stock Exchange. An administration board will be appointed to oversee SAITM and any other private medical university. Discussions on these issues will take around eight weeks. The GMOA which had earlier announced a strike over SAITM, cancelled it on the request of several other trade unions, as a grenade attack was revealed on the Sri Lanka Medical Council premises. The grenade had not detonated. The GMOA and other trade unions have requested the Government to nab the culprits within one week. In the midst of all this, a solution to SAITM acceptable to all could be in the offing soon.